Mary Blanche Starr MacNicol was the fourth wife of Roy MacNicol, an American artist who in 1954 bought and remodeled the D. H. Lawrence house in Chapala. From spending time in Mexico, she became interested in local Mexican cuisine, especially that involving flowers, and later wrote Flower Cookery: The Art of Cooking with Flowers (New York, 1967). Mary Starr was born in Georgia in about 1896. According to a post on a genealogy site, she graduated from the University of Georgia and then taught for some years in Hartwell, Georgia, where she became close friends with Georgia Senator Richard B. Russell, before moving to Florida. Her first marriage, in 1935, to Bassett Washington Mitchell, a real estate investor of Palm Beach, Florida, ended on his death in September 1946. The following year, on 27 March, she married artist-writer Roy MacNicol, who had been married twice previously, in Palm Beach. MacNicol had been a Palm Beach regular since at least the mid-1920s. In 1949 Mary Starr MacNicol requested Federal Court help with paying her debts, presumably in order to wind up her husband’s estate. She told the Court that she had assets of $371,580 but was unable to pay her debts as they matured. She listed debts of $224,346 and asked the Court to make arrangements for her creditors to be paid. In 1954, Roy MacNicol bought, and began to remodel, the historic house in Chapala which D. H. Lawrence had rented in 1923. After this point, Mary and Roy MacNicol seem to have divided their time between Chapala and New York, with occasional trips elsewhere, including to Europe. (In November 1956, for example, the couple arrived back in Palm Beach, from Europe, aboard the Queen Mary.) Their New York home, from 1956 (possibly earlier) until Mary MacNicol’s death in about 1970, was at 100 Sullivan Street. “Mrs. MacNicol began exploring the possibilities of cooking with flowers when she was the lessee of D. H. Lawrence’s house at Lake Chapala.”, adding that “Mrs. MacNicol researched Aztec methods of flower cookery and once attended a six-course flower supper in Morelia. 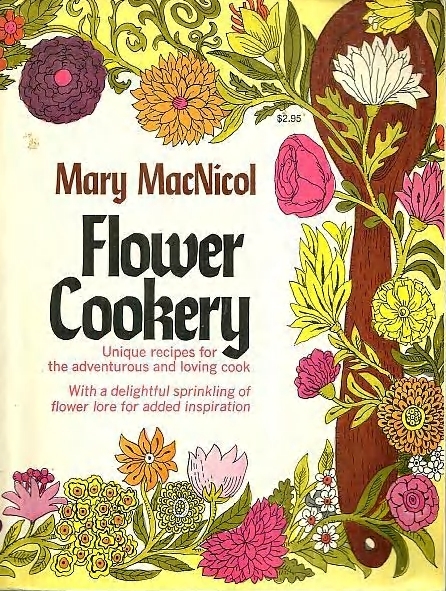 Lilies, yucca, roses and jasmine are ingredients in Mrs. MacNicol’s recipes. So are clove-carnations or gilly flowers and marigolds the flavor provider for Dutch soups. Wash blossoms and remove stems. Drain dry on paper towels. Mix other ingredients to make a smooth batter. Dip blossoms in batter and fry in oil until brown. Serve hot.